NOTE: Advertising is a premium feature and only available for apps on a premium plan. iBuildApp offers three types of advertising for iPhone apps: iAd banner, AdMob banner, and custom HTML banner. Once set up, the banner will be displayed at the top of the screen within your mobile app. Please visit the iAd advertising web page to learn more about advertising on the iAd Network. To advertise in AdMob network, you must create a campaign, an ad group within that campaign and ads within the ad group. 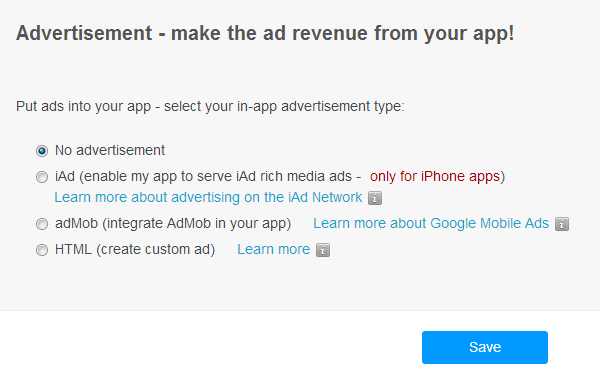 Some Android and iPhone application developers now have the option to serve Google AdSense ads when an AdMob ad is not available. With this option set, the service will attempt to fill your ad request with an ad from the Google network if an AdMob ad is not available at the time. Enter your daily budget (minimum $50). You can control the maximum amount of ad spend per day by setting a campaign daily budget for your ads. Each day, all ads running in your account are served until the budget you set is depleted, after which your ads are paused until the following day, or until you increase your budget or replenish the funds in your account. Select one of the following ad group goals: - Mobile Web: You want users to visit your mobile website when they click your ad. - Applications: You want users to download your app from the Apple App Store or Android Market when they click your ad. - Media: You want users to view video content on your site or audio content from the iTunes store when they click your ad. - Location & Utilities: You want users to call your business, find it using a map, or search for specified content when they click on your ad. Note: If you select the Apps, Media, or Location/Utilities ad group type you will need to select the appropriate app platform, media type, or form of location information. You have now added your iPhone app to AdMob network. Ads are not shown on your app until you activate it by implementing the install code. You can access the install code by clicking Setup to the right of the app that you wish to activate. Copy your Publisher Id and paste it on iBuildApp App settings page. Custom HTML option allows you to input an image or text that shows up on the banner at the top. When enabling custom ads in your application (selecting HTML radio button), it will activate the functionality to embed your unique advertisement that you can manage via App Settings page. Use our WYSIWYG editor to create your ad block. Please make sure your ad content fits the visible area of WYSIWYG editor (320x50 px).